My homemade chocolate candy sinks while cooling, and I can't figure out why! 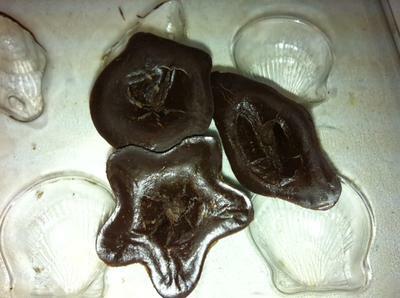 I made these homemade molded chocolate candies with coconut oil, cocoa powder, honey and peppermint extract. I then let them set on the counter for 30 minutes before refrigeration thinking maybe it was air bubbles causing the chocolate to sink. I also hit the trays on the counter a few times to try to tap out any extra air. Finally, I put them in the fridge and this is what the bottoms look like when I take them out! I love that you're making your own chocolate using coconut oil, cocoa powder, and honey. I have a friend that does the same, except he uses pure maple syrup for the sweetener, instead of the honey. I have to be honest and say that I'm not quite sure why your homemade chocolate candy sinks while cooling, especially since you've made the effort to tap out the excess air in the mixture. I know that making chocolate this way doesn't give the same texture as a commercially made chocolate, but as for the sinking in the center, I have a feeling it is something to do with science (NOT my strong point!). It's probably something to do with the way the temperature is reacting with that particular type of sugar or fat, drawing it away from the center and causing that sinking appearance. Let's post this live on the site and see if someone more clever than I can give you some insight on the exact reason why your homemade chocolate candy sinks while cooking.